There seems to be a universal concuss at CinemaCon that the chicken salads served at Caesar’s Palace these days are much better than the ones at Paris and Bally’s back in ShoWest days. But if it is food for thought you are after, then you could not asked for a more tasty, nourishing and beautifully prepared presentation than the one dished up by Julien Marcel, CEO of Webedia US. Best known as the parent company of Box Office magazine, Webedia is in fact a sprawling federation of global media publications and outlets. So Marcel should be uniquely placed to know how to adapt and used the best online tools for collaboration across a vast organisation. He shared this insights in an informative and engaging presentation that everyone would have benefitted form listening to. “When we see all this innovation, that is fascinating and frightening. But where do we start. That is what I want to focus on,” is how he started his presentation. He then disarmingly went on by revealing a personal business failure. Fresh out of business school in 1998 he was put in charge of Trinitron’s research project of flat panel displays and digital cameras, while the company’s main effort was on the world’s first MP3 player, the RCA Lyra. So the company that didn’t really care about flat panels or still cameras also failed at digital music players when Apple came along with the iPod. “What are my key takeaways from my sad stories,” Marcel asked, before sharing his learnings. Expect the unexpected. What is most important is not to be first with the new trend, but to understand the economy and the business in which you area at. Being the first is not the key success factor. [Steve] Jobs was not first with MP3 players or smartphones. But Apple won. Having an idea is also not enough. I know a lot of companies that have run into key ideas. I don’t know of any company that has randomly executed properly. Also the pace at which things change has dramatically increased. We live in an age of high speed. We advance at a speed that is increasing dramatically. It took 40 years to connect 2.5 billion people to the internet. It will take 36 months to connect the next 2.5 billion. By this time Marcel had the audience’s full attention, not just with his insights but with a set of Keynote slides that would have done Steve Jobs proud in their simplicity, directness and elegance. No endless paragraphs of texts, just images mostly, a few charts, some key quotes or even just a few words. He noted that the digital cinema transformation has actually been quite slow and didn’t just happen over a 19 month period. Compare that with the pace of uptake of online ticketing in China, which went from 22% to 70% of total contribution to box office between 2013 to 2015. 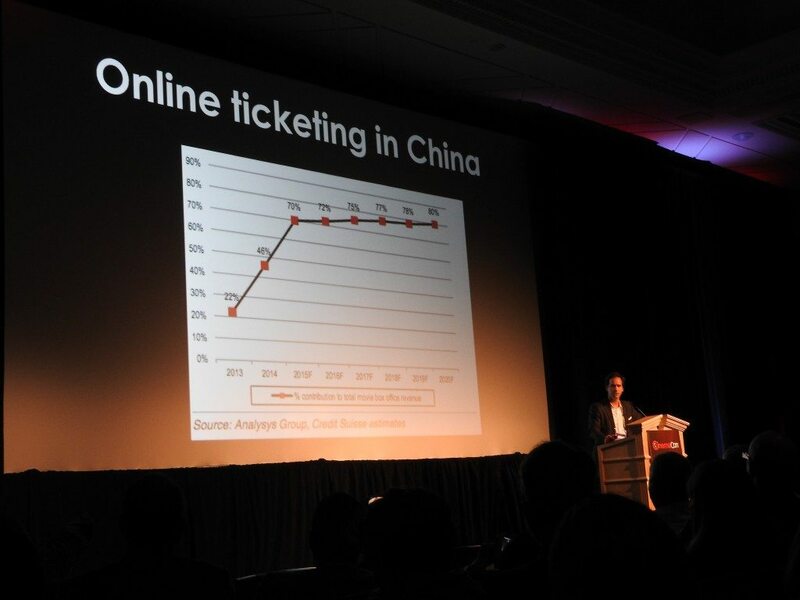 “Chinese internet giants BAT [Baidu, Alibaba and Tencent] have disrupted the cinema ticket market in China,” he noted. “What if we get disrupted in mature martkets at the same speed?” This was an audience that definitely did not have an appetite for being disrupted. Amber Stepper, VP Global Marketing for National Amusements had earlier that day observed that “any delay in adopting a faster path of technology is hurting us, whether we know it or not,” and it was a theme that Marcel developed further on the subject of the Platform Economy. The Platform Economy – we live in it. The environment in which we live is ruled by GAFA [Google, Amazon, Facebook, Apple]. The have a constant relationship with clients. This is a win-win relationship. 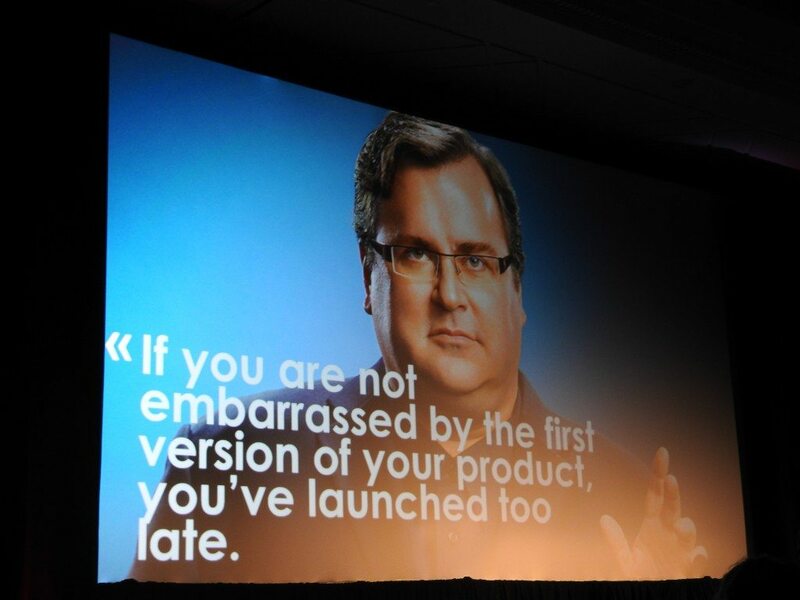 Create an ecosystem instead of launching a product. Marcel went on to note that digital will represent 25% of the entire world economy by 2020 and platform companies are a $2.5 trillion dollars business. This means that we have to embrace a new business model: linear business is valuation creation in a one-way. “Platform driven is different,” he noted. “Value creation is two-way and continuous.” He then looked at the example of the ‘barbarians’ that have succeeded in these new types of ecosystems. Lightning doesn’t strike twice in the same place. In 2004 there was the first massive disruption with Booking.com, Expedia, Hotels.com and depending on the country, between 15%-25% of margins of leading hotels has disappeared. By 2012 the hotel industry was getting there; rebuilding their margin. Then comes the second barbarian: AirBnB. Today AirBnB sells one million nights per day. More than the combined sales of the top five hotel companies are in the world. Five years ago the hotels did not take AirBnB seriously. Before anyone started thinking that the Screening Room was about to eat their chicken salad lunch, Marcel reassured them that not all established players are doomed to fail. GE created the concept of ‘destroy your own business.’ It involved coming up with scenarios that involved envisioning your business dyuing. Each business had a mentor 20-25 year old, who would challenge the manager in how he or she thinks. GE thought their business would be disrupted in two years. It was actually 15 years. “But they had the right mindset form the start. Let’s identify a few things they do right,” Marcel challenged his audience. They got rid of the silo mentality. In our industry, what are the silos? Maybe each location in a cinema chain is a silo. Traditionally we value autonomy, but it can be the start of silo mentality. Employees don’t belong to location A, B, or C, but to the organization as a whole. So you have to turn them into virtual team players. What tools can help you build product teams – who has what know-how? This involved switching from horizontal to vertical companies. He then illustrated this point beautifully with a photo of the office of Facebook’s Mark Zuckerberg (below). Yes, Mark Zuckerberg sits in an open plan office. No corner suite for the multi-billionaire king of social media. Julien Marcel then asked his audience, “Who uses Slack and who has never heard of Slack?” There was definitely more in the latter category. After several delicious appetisers and starters this was the main dish of the presentation. Marcel did not simply slap his audience in the face (proverbially) by pointing out what dinosaurs they were, but actually provided them with tools they can use to improve their business. This is what made his presentation so valuable. So what exactly is Slack? Corporate messaging system. It replaces a lot of email exchange. Slack has 2.3 million daily users. Created in 2013. Average time is 5 hours and 30 minutes per week. 50% reduction in emails for Slack users on average. Slack is like the archetype. Slack has market cap of $4bn. (I’m afraid I don’t have shares in it). So why switch to Slack? One of the reluctances I had is that email is more practical and relevant – but that is not true. It is because I am not a digital native. Is it because managers are not used to instant messaging. It might be Slack or Facebook For Business. The messeging approach is replacing email. I checked with my daughter and 20 year olds. 20 year olds check email at least once per day [sic!]. His message was that “messaging is going to transform your business.” Facebook for business is growing, because it is a a priority for them. He is also noted that there is a huge focus on payment through messaging, which is what has transformed Chinese messaging. This is going to transfor your business. Try this for yourself. Talk to your 20 year old and let them educate you. Interestingly Slack was born out of failure. The creator twice tried to build a video games company, but when that failed he instead spun out two products that were internal ways of photo sharing and internal messaging. “In terms of transformation, one that is hard to swallow is that you have to built to fail,” Marcel noted before putting up a slide of a quote by Reid Hoffman that made me poke my business partner, sitting next to me, in the ribs. The message is pivot / innovate. The signal has to come from the top, Marcel urged. “Your top priority should be to convince your boss that digital transformation is what you need to do. Challenge the way you work and engage with younger employees.” Yes, that would be this kids that seem more interested in their smartphone screen than the Big Screen. MBAs are useful, but there is something more useful. MBWA – managing by working around. Young employees are passionate about movies and they can teach you about digital transformation. Learning & Training. There are a lot of new tools. MOOC. Nowdays you don’t train people the way you did ten years ago. You have Periscope and Facebook Live. Regardless of the physical location. Right management of timing – short term versus long term. You can’t keep people excited about digital transformation if they have to wait 18 months. You need to launch fast. Show clear sign that there are short term goals and that creates momentum. API – You need to live in a world of open data, sharing data. Best way is APIs. Openness, transparency, I could have elaborated about digital security, but it is built around bigger issue of digital trust. You have to be trustworthy to all your partners. Hackathon – Give developers your tools and let them play with it in terms of coming up with tools for you. French tax authority recently launched their first Hackathon, but the name of the game is a new online tax payment. Come and develop service applications that make the most of it. He then asked whether this is just the approach for the Top 10 exhibitor companies. “No, this is for all players and all exhibitors.” The smallest independent chains have to put emphasis on digital transformation. Everyone needs to work together to build new tools that embrace the culture of change. “You need to join forces to participate in this game,” was Marcel’s call to action. The key element is not technology but people. It is about creating a culture where it is ok to fail by innovating than to wait and not be innovating. Your company has to evolve with these changes. And with that his presentation was over. Marcel almost ended apologetically by saying that Webedia would now “offer food to all of you who sat through all of this long presentation,” as sponsor of the reception outside. But those of us that heard him speak had already feasted at a great presentation that was precisely target at the cinema audience. How do we know? Because as it ended, myself and Sperling ended up chatting with an exhibitor from Florida about the advantages of Slack and how we ourselves use it for Celluloid Junkie. If only a handful of exhibitors come away from this talk willing to try out tools like Slack then Julien Marcel and CinemaCon will have done them a huge service. There should be more talks like this.